“In that scenario he has to play for the two, so he’s playing to make that double,” said a relieved Muyres. “If he plays it safe and makes it for one, he’s got a 15, 20 per cent chance of winning in the extra. So all teams are going to play that aggressively and he threw it to make it and it just rolled over the top. 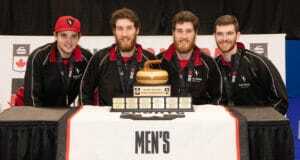 The win for Muyres, third Kevin Marsh, second Daniel Marsh, lead Dallan Muyres and coach Lyle Muyres, was a tough one after they scored four in the third end and then gave up three in the fifth that put Quebec, which had scored two in the second end, back in control. But Quebec gave up a single in nine to retain hammer, only to have it slip away in 10. “That sucked; it happens,” Muyres said of giving up the three after scoring their four. “We weren’t that sharp today, but we weren’t that bad. We knew coming into this thing you’re going to have about three of those games you just have to grind out and that was one of them. 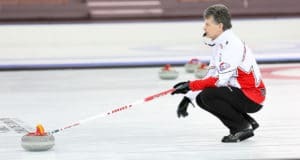 Jon Solberg and Team Yukon (2-2, Whitehorse) lost lead Scott Odian to a knee injury mid-game but still put a dent in the hopes of Mike McEwen and Team Manitoba (2-2, West St. Paul) by scoring three in the third end, two in the fifth, one in nine and stealing one in 10 for a 7-6 win. Odian injured his right knee while delivering a stone in the seventh end and was replaced by alternate Dave Rach. “I got 50 per cent of the win and Dave got 50 per cent of the win,” said Odian. Their steal came when McEwen had a routine hit-and-stick for the win but had his stone roll out. “I can make those with both my eyes closed and I didn’t today,” said a disappointed McEwen. 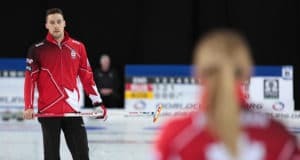 The 2019 Tim Hortons Brier continues with this evening’s draw at 7 p.m. CST.